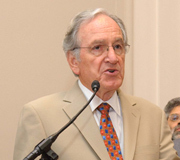 Senator Tom Harkin is now the chairman of a key U.S. senate committee that had been led by the late Senator Ted Kennedy. Harkin, a Democrat, is the new chairman of the Senate Health, Education, Labor and Pensions Committee. “A great honor and a challenge,” Harkin said of the move this afternoon during an interview with Radio Iowa. Harkin led the Senate Health, Education, Labor and Pensions Committee in writing the wellness and prevention components of the health care reform bill which cleared the panel earlier this summer. Earlier this year The Hill — a Washington, D.C. publication — surveyed members of the U.S. Senate and Republican senators ranked Harkin as the fourth most bipartisan senator. Harkin is giving up his role as chairman of the Senate Ag Committee, as senators may only lead one committee. Harkin was appointed to the House Ag Committee when he was elected to congress in 1974 and then became a member of the Senate Ag Committee when he was elected to the U.S. Senate in 1984. Harkin was chairman of the Senate Ag Committee when it wrote the 2002 and 2007 Farm Bills. Harkin, as the new chairman of the Senate Health, Education, Labor and Pensions Committee, will be in the unique role of being chairman of the policy committee on health and education issues at the same time he leads a senate appropriations subcommittee that writes the budgets for those areas of the federal budget.